Need a comfy seat in your home? 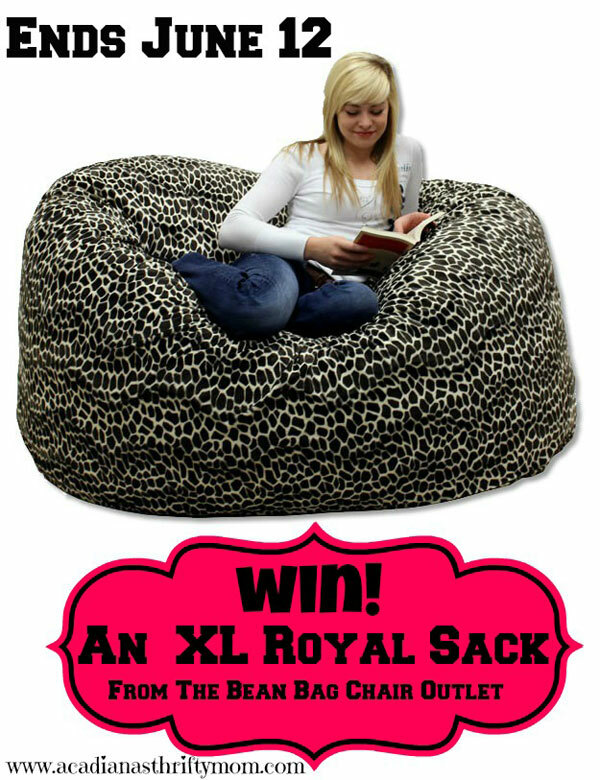 We are giving away an X-Large Royal Sack from the Bean Bag Chair Outlet to a lucky fan. Giveaway is hosted by Acadiana’s Thrifty Mom and sponsored by Bean Bag Chair Outlet. These are also perfect for kids with their removable & washable covers. You can read Acadiana’s Thrifty Mom’s full review HERE! One lucky reader will win their very own XL Royal Sack. Giveaway is open to US only. Giveaway ends June 12, 2014 at 11:59 pm EST. Enter the Rafflecopter below for your chance to win. Disclaimer: The participating bloggers were not compensated for this post. No purchase is necessary to enter. Void where prohibited by law. The odds of winning are based on the number of entries received Open to US 18+ only. Confirmed Winner(s) (by Random.org) will be contacted by email. Winner(s) have 24 hours to respond before a new winner is chosen. No purchase necessary. Void where prohibited by law. The Bean Bag Chair Outlet will be responsible for product shipment to winner(s) of this giveaway. My blog is not responsible for product shipment/delivery. This event is in no way administered, sponsored, or endorsed by, or associated with, Facebook and/or Twitter, Google, Pinterest. This disclosure is done in accordance with the Federal Trade Commission 10 CFR, Part 255 Guides Concerning the Use of Endorsements and Testimonials in Advertising. i have a betta fish. No I do not own a bean bag chair. My kids have a little one. I do not own a bean bag chair, I did in college. No, I don’t at the moment but I loved them as a kid. I would love to win one of these for my family to use. I don’t have a bean bag chair. No I don’t own a bean bag chair. No we don’t own a bean bag chair, we did at one time, but it ended up getting some holes in it and we had to get rid of it. My kids each have a small bean bag chair we filled ourselves. No, but I’ve always wanted one and my boys would love it too! nope, the dog peed on our last beanbag and it had to be thrown away! We do have one, but it’s not nearly as nice as this one! I do not have a bean bag chair but I have always wanted one! Hello! No. I don’t own a bean bag chair but these look really cool. Thanks!! I do…a very old one from my college days, which was a good 50 years ago. No, but would love to have one! I don’t own one currently. I used to have one when I was younger and loved it. I don’t own a beanbag chair, but would love to own one of these awesome beanbags! I do not own a bean bag chair but it would be awesome to win this one. No, I don’t but they look really comfortable. I do not, but they look really nice!! We have two in our house! I don’t on a bean bag chair but I’ve always wanted one, they look so comfy. No, I don’t own one, I never have. Yes, and my girls fight over it. No but I use to have one as a teenager and loved it until all the stuffing came out. I don’t currently have a bean bag chair. I think they are so comfy! I don’t have a bean bag chair…yet! I don’t. But I’ve been wanting one for a long long time. We don’t own one but my daughter has been begging for me to buy one for her! We do not currently own a beanbag chair but I know that my kids would love one for watching TV. I have never owned a bean bag chair but have always wanted to. no but would LOVE one! No but I want one. I keep a child with CP and a bean bag chair would let them sit on the floor to play. I don’t currently own a beanbag chair but did as a teen and I absolutely loved it! We had a little bitty one for our son when we was little, but I have never had a grown up one. I would love one! I would love a beanbag chair. I don’t own a bean bag chair, I would love to have one. I do not own a bean bag chair! No, we don’t, but my kids would love one! No not at this time but years ago I have a small one. We do own a beanbag chair and we love it! I do not own a bean bag chair but would love to! No we do not have a bean bag chair. I don’t, but I know my whole family would love this! No I have never owned one but always wanted too. Not yet but we want to get 3 when our lounge is done! I don’t presently own a bean bag chair, though I have in the past. I don’t own one, but I’ve always wanted one 🙂 Thanks for the chance to win! No but my granddaugher would love this one. I own a really old red vinyl ordinary bean bag, but these bean bag chairs look awesome! I haven’t had one since I was really young! I have never owned one, but these look so big and comfy! I don’t own a bean bag chair but I would like one for my son’s room. no i do not have one of those yet. No, I don’t own a bean bag chair. No we don’t have one yet. My husband loves these big ones though. I do not own a bean bag chair, but i so want to. No, we don’t have a bean bag chair. Hey did I win. Never received an email. Thank You cant wait to receive it.